Spike Lee, Jada Pinkett Smith to boycott Oscars over all white nominees. 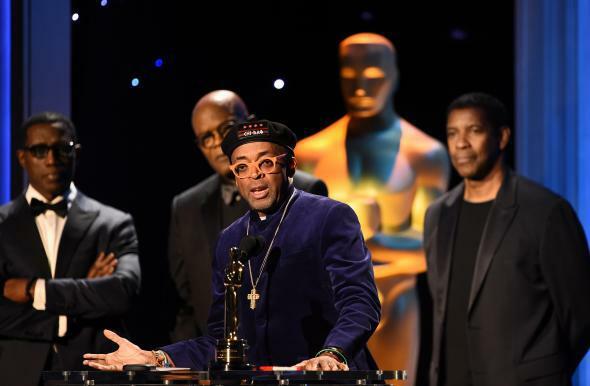 Spike Lee accepts lifetime achievement Oscar in Hollywood, California on November 14, 2015. Director Spike Lee and actor Jada Pinkett Smith announced on Monday that neither will attend this year’s Academy Awards to protest the lack of diversity of the nominees. The Oscars again faced criticism and widespread disbelief for the second straight year as the nominees in the major categories were all white. Lee, who did not receive any nominations for his film Chiraq, took to Instagram to announced he and his wife will be boycotting the Feb. 28 ceremony. In a separate post on Monday, Pinkett Smith also announced she will skip this year’s ceremony to protest the lack of diversity among the nominees. “We can no longer beg for the love, acknowledgment or respect of any group,” Pinkett Smith said.